Zermatt, Switzerland – Team USA had good reason to celebrate their national holiday today in Zermatt, Switzerland, with double silver on the men’s side and bronze on the women’s at the 12th World Long Distance Mountain Running Championships. Leading the men to a silver medal team finish was Andy Wacker, 26, Boulder, Colorado, who posted a time of 3:03:51 to earn individual silver and 2000 Swiss Francs. Wacker’s teammate and fellow Coloradoan Peter Maksimow, 35, Colorado Springs, finished just inside the money earning 100 Swiss Francs with a solid15th place effort in a time of 3:19:45. Rounding out the team scoring was Mario Mendoza, 29, Bend, Oregon, timed in 3:21:46. David Roche, 26, Mountain View, California finished 35th in 3:32:09. Italy placed three athletes in the top five to take gold with champion Tommaso Vaccina in 3:01, third-place Francesco Puppi in 3:04, and Massimo Mei in fifth in 3:07:55. Team Kenyan, looking solid early in the race, faded as the climbs began, but still managed to score the bronze medal. “I thought Kenya would be unbeatable,” said Wacker who led through ten miles. “We (three Kenyans and me) were running in a pack and for some reason they kicked at the 20k mark. Once they settled down (after the surge), and once the climb started, it was me and just one of the Kenyans (last year’s winner Paul Michieka). We made a big gap after mile 15, and at 20 miles, he got a bit ahead. I thought I could catch him, and I did and we were neck-and-neck for about 3 miles during a rolling part of the course. Mendoza, who was second American through the half marathon, said, “That first half was pretty smooth – still some good climbs, but nothing crazy. Once I hit miles 16-17-18 – the real steep parts, I kind of struggled there. I started going backwards (in terms of place) and then from miles 18-21 which were a little flatter the altitude didn’t affect me so much. On the women’s side, the host country dominated with four athletes in the top ten including champion Martina Strahl who blazed the course in 3:21:38, more than nine minutes ahead of second place finisher Aline Camboulives of France who clocked 3:29:45. Rounding out the top three was Catherine Bertone who led Italy to a silver medal team finish posting a time of 3:33:56. The U.S. women, led by fourth-place finisher Stevie Kremer, 31, Crested Butte, Colorado, in 3:32:09, took the bronze. Fellow Coloradoans Brandy Erholtz, 37, Evergreen, and Megan Kimmel, 35, Silverton, rounded out the scoring in 3:48:44 (15th place) and 3:48:59 (16th place) respectively. Maria Dalzot, 27, Bellingham, WA, ran within one minute of her goal time to finish in 3:54 in 18th position, followed by Megan Roche, Mountain View, CA, 25, in 21st place timed in 3:55:45. “In Zermatt, Stevie pulled away. She just took over on the uphill,” said Kimmel. “It was really hard come 25k. I started getting cramps and that kind of slowed things down to survival. Kimmel reflected on her effort saying, “I was happy with my start. I felt like I paced pretty well, I just wish I was better trained for it. In the past four weeks, I was lacking a long run…14 miles just doesn’t cut it. Going into Zermatt I felt good – I kept my eye on the group in front, but everything changed after Zermatt. At the 8:30 a.m. race time, temperatures hovered in the upper 60s under a cloudless sky in St. Niklaus located at an elevation of1085 meters. The course wound up the valley through the town of Zermatt, elevation 1600 meters, which marked the halfway point in the race. When the first runners came through Zermatt, the temperatures were already reaching the 70s. After a total ascent of 1944 meters, and 444 meters of descent, competitors arrived at the finish line at Riffelberg, elevation 2585 meters. The temperatures, like the altitude, increased through the day making hydration and fueling even more important for the nearly 2000 runners who took part in the Championships (a total of 52 women and 62 men representing 22 countries with 15 complete men’s teams and 11 complete women’s teams), and the associated events which included an open marathon, half marathon, ultra and marathon relay. Complete results are posted at www.datasport.com. 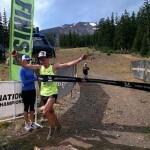 Next on the race calendar for many of the U.S. Long Distance Mountain Running Team members will be the USATF Mountain Running Championships in Bend, Oregon, on July 25. 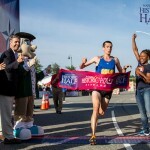 The event serves at the selection race for the 2015 U.S. Mountain Running Team that will compete at the World Mountain Running Championships in Wales on September 19. The course in Bend, like the World Championships course in Wales, will be 12k for the men and 8k for the women.